Young Bella and her Bunny wake up in the morning, Bunny full of energy. Bella and Bunny get ready for the day. They go outside to smell the flowers and plant seed. Enjoying each others company outside. They go through the rest of the day and we conclude with them getting ready for bed. 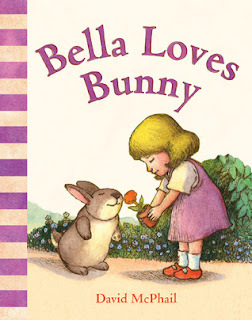 Coming full circle, Bella loves Bunny. This is a cute board book that young girls will enjoy. They will love watching Bunny's busyness and interaction with Bella. Abrams Appleseed an imprint of Abrams. Labels: abrams, abrams books, board book, Children, toddler.